This was the inspiration for my meal although I made a few tweaks based upon what I had available. 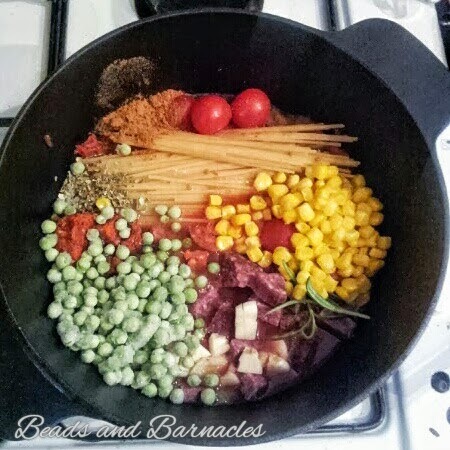 For the veg I used frozen peas and sweetcorn, I used a few cherry tomatoes as well as the can of chopped tomatoes. I also used water and chicken stock powder rather than premade stock so the strength of that was some what estimated. My one major adjusment though was to add in some meat, we had some Elk Sausage from IKEA which needed using, it has a very ‘meaty’ flavour which makes it brilliant as an addition to another meal to give it a boost. This dish turned out brilliantly I am looking forwards to making more of these and experimenting with other flavour combinations.